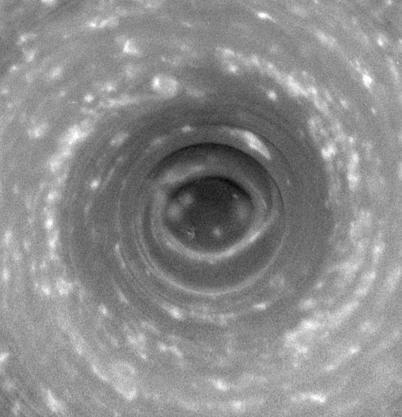 NASA's Cassini probe orbiting Saturn has been literally looking into a monster hurricane type storm in Saturn's south polar region. The storm is huge, 5,500 miles across, with the eye of the storm over 900 miles in diameter. The winds have been measured at speeds of up to 350 miles per hour. The images below show the scene at different wavelengths and clearly show the structure of clouds circling within the storm. 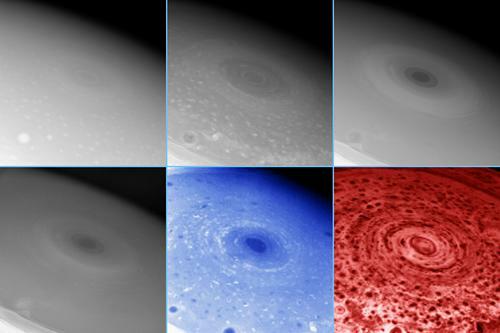 Scientists have not seen anything quite like this before. The storm is centered on the south pole and doesn't appear to move from it, unlike hurricanes on Earth. There's clearly much more to be learned about the ringed planet.